We got up at 5am and began the decorating activities… We completed the tree! Yeah! 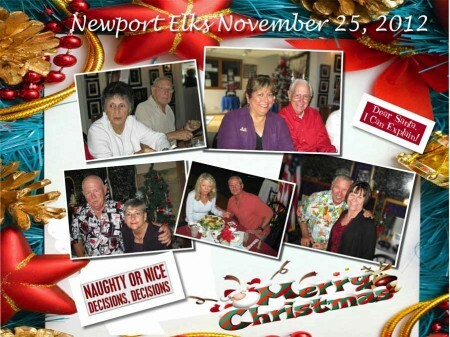 We then went to church and afterwords headed for Newport Harbor Elks for an afternoon of dancing with our friends! Please join us! Enjoying good friendship and good music and a good meal…. Life is good! We departed around 4:30 and headed to the market before going home and collapsing. Sue did two hours on the tread mill and Paul rocked in the rocking chair! We did a marathon of THREE Christmas movies…. Sappy Hallmark Channel movies… The greatest! We are now in the mood! This entry was posted in Dancing, Food and Wine, Friends and tagged Dancing, Elks Lodge, Friends. Bookmark the permalink.